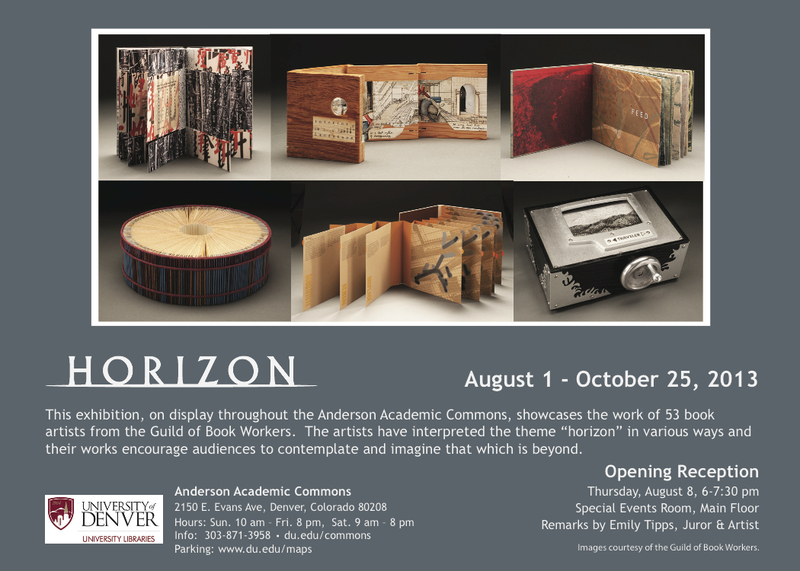 Thursday, August 8, 2013 at 6PM, Horizon Exhibition Juror, Emily Tipps will speak at the Opening Reception of the Horizon Exhibition at the Anderson Academic Commons located on the University of Denver campus. "The horizon is a relationship of perspective, rather than a fixed place. Apparent only through the lens of distance, it is a contemplative focus, a beacon for imagination, a beckoning." 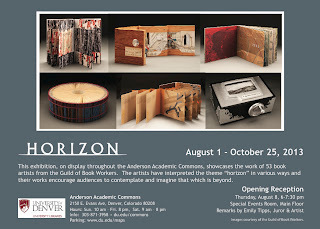 Join us on the Main Floor of the Anderson Academic Commons to view the magnificent works of 53 Book Artists and Guild of Book Workers Members, and hear Emily Tipps speak about her experience as a juror for the exhibition. This event is free and open to the public. The Special Events Room at the Anderson Academic Commons is on the Main Floor.